Paul Zenon, the original Fun Loving Criminal (other aliases include 'King Con' and 'The Sultan of Swindle'!) 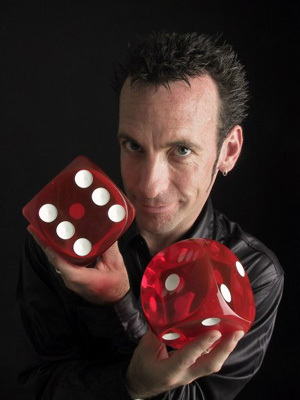 is the UK's leading comedy magician, with dozens of TV credits to his name including three recent hour-long one-man 'street magic' specials screened by Channel 4. Paul has appeared in around thirty countries and in every conceivable location; from the Tropicana Hotel in Las Vegas to the hold of an aircraft carrier in the Adriatic, from the London Palladium to a clearing in the jungles of Belize, and from The Magic Castle in Hollywood to the back of a truck in a Bosnian war zone. As a teenager, he travelled around the Mediterranean earning his living through similarly suspect practices, the more respectable of which included performing as a street magician and fire-eater and telling the fortunes of tourists ("I can see that you will be travelling in the near future..." etc.). On his return, Paul spent a short spell as a casino croupier before returning to his vocation of trickster and comedian, serving his apprenticeship in summer seasons in Blackpool and Jersey (or 'Club 80 to Dead' as it was known), cruise ships, continental holiday hotels and numerous tours of British and United Nations military bases in Germany, Belize, Gibraltar, the Falkland and Ascension Islands, Croatia and Bosnia. In the early Nineties, Paul presented four series for the BBC (Tricky Business and Tricks 'n' Tracks),produced and presented Magic You Can Do, a teach-yourself retail release video tape, and was the creator and Associate Producer of Crazy Cottage, a children's television game-show which reached number one in the ratings in each of its three series on the ITV network. For over fifteen years Paul has specialised in corporate entertainment, presenting and performing at conferences and events worldwide, as well as being a favourite on the comedy club circuit. His client list is littered with Blue Chip companies and his style and material are fresh, original and contemporary One of his major strengths is his ability to gauge an audience and adapt accordingly: not many performers receive a standing ovation at the Comedy Store and the Savoy in the same evening! His one-man show was a huge hit at the '97 and '99 Edinburgh Festivals, receiving much critical acclaim and five star reviews in The Scotsman, The List and The Guardian. During the past three years Paul has appeared in Ireland, France, Germany, Italy, Greece, Spain, USA, Hong Kong, Malaysia, Indonesia, Kuwait and Australia. He has performed at major theatres around Britain as part of the Comedy Store National Tour, and was 'Special Guest' at the Royal Television Society's annual Craft and Design Awards. In 1999 the hour-long Channel 4 Easter special, Paul Zenon Turning Tricks received rave reviews, and his second special Paul Zenon's Tricky Christmas was Channel 4's highest rating entertainment show of the holiday season. During 2000 Paul performed a sell-out run at the Adelaide Festival, worked as magic consultant for Eurotrash (! ), appeared as 'Special Guest' on all seven episodes of Something for the Weekend (Channel 4), and was one of the select few invited to appear at the opening of the new Comedy Store in Manchester. Recent highlights have included an appearance at the Formula One Grand Prix in Barcelona, a show for the Ford Motor Company in Las Vegas, performances in Jakarta, Bali and Kuala Lumpur, hosting shows for British and U.S. troops on the Kuwait/Iraq border, a BBC1 Hard Cash Special: Cons R Us, repeats of the Paul Zenon Turning Tricks and Paul Zenon's Trick or Treat Specials on Channel 4, appearances on Child of Our Time (BBC1), Shoot the Messenger (Paramount Comedy Channel), Hear'Say It's Saturday (ITV), Stupid Punts (BBC), The Big Breakfast (Channel 4), The Big Stage Magic Special (Channel 5), Live Floor Show (BBC Scotland) and It Shouldn't Happen to a TV Performer (ITV). Recent appearances include The World's 50 Greatest Magic Tricks, a two hour special on Channel 4, The Johnny Walker Show (Radio 2, with Stuart Maconie), The Chris Moyles Show (Radio 1), This Morning (ITV) and The War Magician, an hour-long documentary as part of the Secret History series, also on Channel 4 (provisional transmission date Tuesday 2nd July). The programme explores the life of stage illusionist Jasper Maskelyne, whose magical powers were utilised by the allies in combat against German forces in the Middle East during World War II. A major Hollywood movie based on the story, starring Tom Cruise is currently in pre-production. Edinburgh Festival - Paul will be performing his one-man show at the Assembly Rooms from the 2nd to the 26th of August at 10.30pm. The Off The Street, On The Road Tour: Paul appears at major theatres around the UK from the 15th to the 29th of September. His new book, A Hundred Ways to Win a Fiver, will be available around this time.